World Boxing Super Series have announced another super lightweight quarter final bout for their show on October 27th at the U.N.O Lakefront Arena in New Orleans, USA. 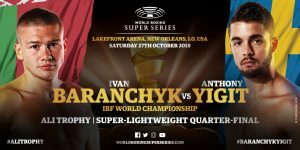 Belarus’ Ivan Baranchyk takes on Sweden’s Anthony Yigit for the vacant IBF super lightweight title. This bout John’s another quarter final the between local hero Regis Prograis and England’s Terry Flanagan for the WBC super lightweight Diamond title. Both fighters gave their thoughts on the upcoming match up via a WBSS press release. “If you step into the ring against Ivan Baranchyk, just know, you will never have an easy fight,” said 25-year-old Baranchyk (18-0, 11 KOs). Yigit, 27, last fought English champion Joe Hughes in a second defence of his EBU strap and is looking forward to getting back in the ring. “I am looking forward to stepping into the ring again after almost a year of training hard and developing my skills,” said Yigit (21-0-1, 7 KOs).